The Reaction Research Society (RRS) was very fortunate to attend an event sponsored by Spaceport L.A. 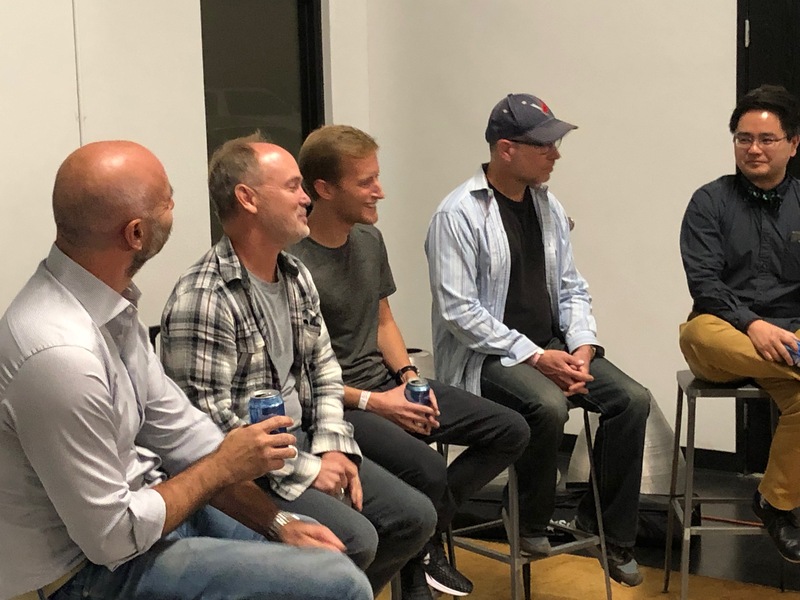 This “Rocktoberfest” event held on November 15, 2018, was at the Relativity Space offices in Inglewood. 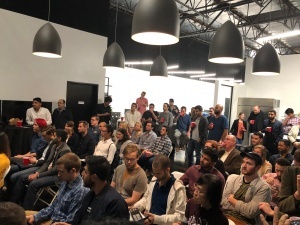 This was a sold-out event with many people present from industry and the space-loving public. Spaceport L.A. is an organization aiming to unite, build and support a space professional community in the thriving heart of Los Angeles. 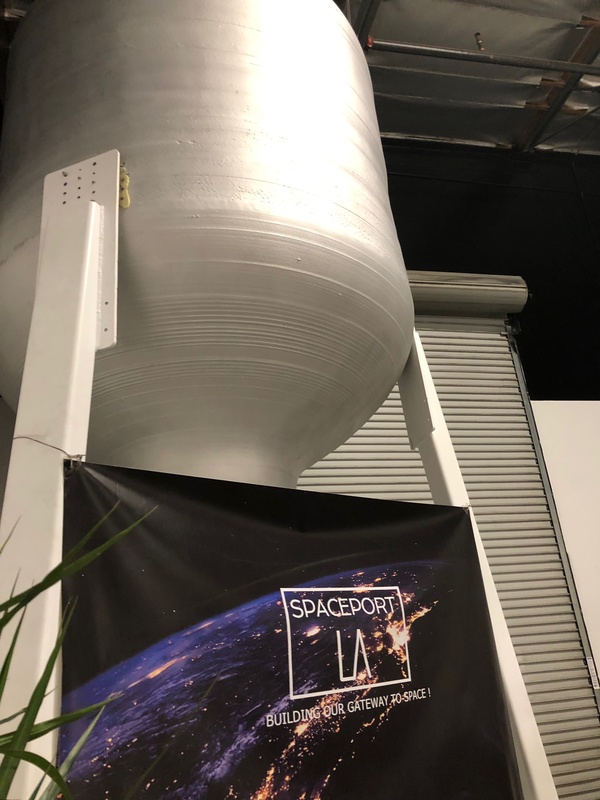 Through discussions, meetings and events held by Spaceport L.A., their aim is to propel further innovations and potentially foster breakthroughs to enhance space exploration. Members include technical professionals from all disciplines and other passionate individuals with the same aim to support the space community. The RRS naturally fits with these goals and we hope to have Spaceport L.A. participate at the 2019 RRS symposium at the Ken Nakaoka Community Center in Gardena in April (exact date to be confirmed soon). 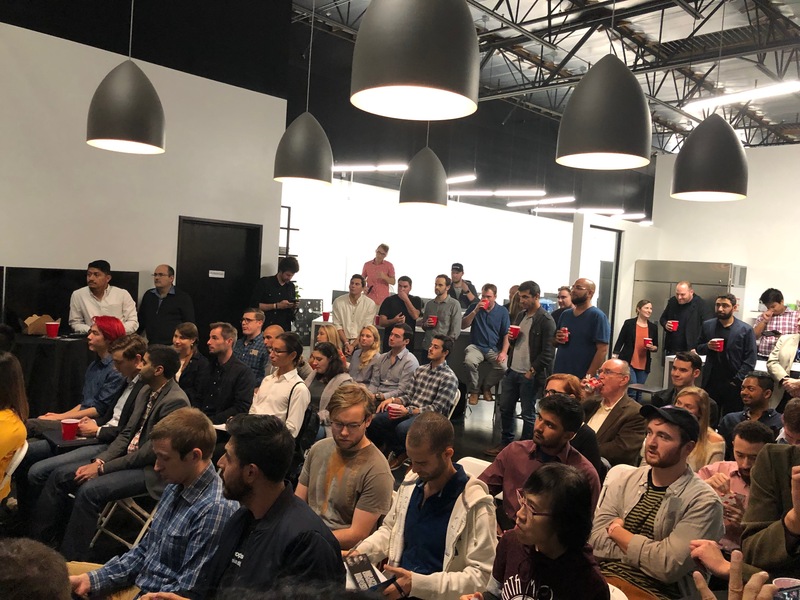 The event brought a good crowd with people from Virgin Orbit, SpaceX, Phase Four, Aerospace Corporation and other professional organizations. The pork schnitzel offered from the food truck outside and the beer served at the event made for a fine supper before the panel discussion that was to take place. 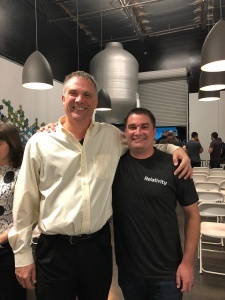 Contrary to the hopes of many, Relativity did not offer a tour of their facilities at the event, but several members of Relativity were in attendance including former University of Southern California (USC) Rocket Propulsion Laboratory (RPL) member and Chief Technical Officer (CTO) of Relativity, Jordan Noone. I had a chance to talk with Jordan and his new Director of Propulsion at Relativity, Nate Scholten. Relativity is an orbital launch company founded in 2015 by Tim Ellis and Jordan Noone that is taking a fundamentally new approach to building and flying rockets. With its customized and proprietary 3D printing technologies, they plan to iteratively build rockets at a cost and speed that better enables humanity’s visions in space. Also, in attendance at the event was Mike Kwapisz, Vice President of Engineering at Phase Four (P4). Phase Four is an El Segundo based start-up company making a new RF-based electrode-less, electromagnetic-based propulsion system. The “Maxwell” engine is designed for high reliability, long operating life and is modular for smaller low-power satellites to larger spacecraft systems. The panel discussion had many fine speakers representing a wide swath of newer aerospace industries. Tim Buzza, former SpaceX manager and now a director at Relativity Space, gave a very insightful talk about his early days at SpaceX with the Falcon 1 and the trying times they had in bringing a new launch vehicle to the market. Dr. Greg Autry, also on the panel, is a founding director of the Southern California Commercial Spaceflight Initiative at the USC Marshall School of Business. He offered many great insights about how the commercial space market has grown from once a purely speculative concept to an expanding and thriving industry in the United States and abroad. Spaceport L.A. panel discussion, Marco Villa (Tyvak), Tim Buzza (Relativity Space), James Behmer (Phase Four) and Gene Autry (USC) with Curtis Iwata moderating. James Behmer of Phase Four was also on the panel and shared a bit of their history in bringing a new modular propulsion technology into the growing small satellite market. Lastly, Marco Villa, Chief Operating Officer (COO) of Tyvak Nano-Satellite Systems, was on the panel sharing his insights from his previous days at SpaceX as the Director of Mission Operations. Dr. Villa also talked about how Irvine based, Tyvak is developing nano-satellites for the growing market. He also mentioned an interesting statistic that today there are over 100 companies world-wide that are endeavoring to offer access to space. In an age of consolidation, it is good to hear how the market is expanding in some respects. The panel discussion was fascinating and I hope Spaceport L.A. will sponsor another event soon. I am very thankful to Curtis Iwata and all of the volunteers at Spaceport L.A. for coordinating a great evening that fostered many great discussions with more to come in the future. I have left a link to the Spaceport L.A. website above and a few links below to the companies represented on the panel. Also, I am grateful to Relativity Space for opening their doors for this networking event through Spaceport L.A. It was a fascinating night. Please look for the next RRS event or just stop into one of our monthly meetings at the Ken Nakaoka Community Center in Gardena. Our next meeting will be Friday, December 14, 2018, at 7:30pm. This entry was posted in Media and tagged 2019 symposium, 3D printing, cubesats, electric propulsion, nanosatellite, orbital launch, Phase Four, Reaction Research Society, Relativity Space, RRS symposium, Spaceport L.A., SpaceX, symposium, Tyvak Nano-Satellite Systems by Dave. Bookmark the permalink.